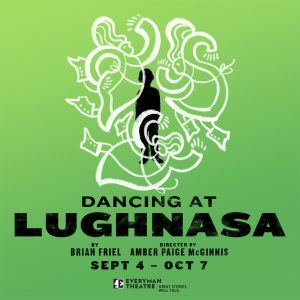 Dancing at Lughnasa by Brian Friel and Directed and Choreographed by Amber Paige McGinnis, is the story of a memory, told by Michael Evan’s as he looks back across a quarter-century, to August 1936 during the Festival of Lughnasa. 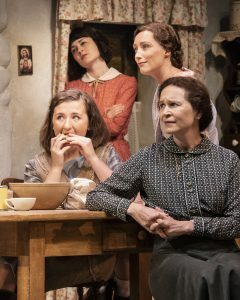 The five unmarried Mundy sisters – Michael’s mother, Christina, and his aunts, Kate, Maggie, Agnes, and Rose – live together in a cottage outside the fictional village of Ballybeg, Ireland. Their brother, Father Jack, has returned after 25 years as a missionary on a leper colony in Uganda, with malaria, a spotty memory, and some contrary ideas. Before long, Michael’s charming but unreliable father, Gerry, resurfaces, as well. As the Industrial Revolution finally makes its way to Ireland, we find this family in transition, but between what? Old and new? Real and imagined? Together and apart? Restraint and abandon? Well…yes. 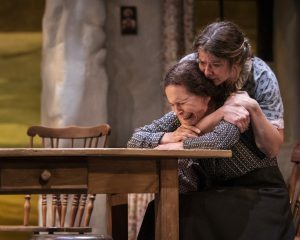 Dancing at Lughnasa is a beautiful piece of theatre that may be an entirely different story for each patron. 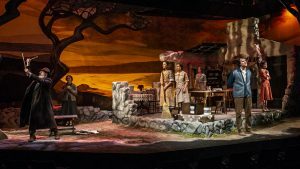 The action takes place in and around the Mundy sisters’ cottage, which is brilliantly realized by Set Designer Yu-Hsuan Chen. I am legitimately in such awe of her set that I struggle to find the words to praise it. Chen has so beautifully captured the line between reality and memory with a perfectly-appointed cottage kitchen (complete with smoke from the chimney of the wood-burning stove), the walls of which seem to have dissolved away so we may sneak a glimpse into the lives it contains. The cottage is surrounded by impressions of wind-swept trees and an abstract landscape. I truly felt like I was looking in on someone else’s memory and it made me uncomfortable in the best possible way. Chen’s set is nothing short of perfection. Upon entering the theatre, patrons are greeted by Irish music, which foretells the wonderful sound design by Phillip Owen. Music (or the lack thereof) is almost another character in the play, and Owen’s design is spot on. David Burdick’s costume design is excellent and appropriate for each character, and I appreciate Annie Nesmith’s almost-undetectable wig design. For the most part, the actors seem to have taken well to the dialect coaching of Gary Logan and I was grateful that he chose diction over dialect without losing the authenticity of the accent. Props Master Jillian Mathews may well deserve an unsung hero award for her work on this production. The sheer volume of “things” on the stage is overwhelming, giving the cottage and yard an authentic, lived-in feel. Kudos to Stage Manager Cat Wallis, as well – it seems like there are so many nearly imperceptible moving parts to this show that no one will ever know, thanks to Wallis. Jay Herzog’s lighting design is stunning, which is no surprise. I would honestly go see a production at Everyman Theatre just for his design work. 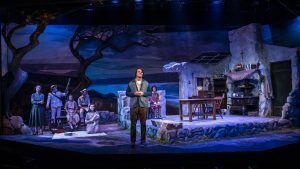 In a production that transitions between past and present, we expect to see shifts in lighting to represent the time change, but it is all too often done with a heavy hand, which makes me feel disrespected as an audience member. Herzog takes a gentler approach and his subtle transitions enhance the story, rather than becoming the story. I also always love his use of pools of light, instead of a consistent spot, to track an actor across the stage. L-R: Megan Anderson and Tim Getman. As the play begins, the adult Michael (Tim Getman) invites us into his memory and the lights come up on the rest of the characters in tableau. 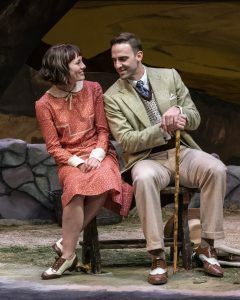 Getman adeptly breaks the fourth wall consistently throughout the play and his performance feels genuine, never forced or overly sentimental (In fact, none of the actors get weighed down in sentiment, which is a testament to Amber Paige McGinnis’ apt direction of this piece). As he stands outside the action, he also takes on the persona and delivers lines for his seven-year-old self – a challenge for him and his fellow actors to interact without interacting. I enjoyed this device immensely and it is well-handled by all. The oldest sister, Kate (Bari Hochwald) is stern, but likeable. Toward the beginning of the evening, Hochwald seemed a little unsure of herself, but as the show went on, I thought it might be a character choice that she hasn’t fully settled into yet. I did, however, enjoy her performance. Kate is the practical sister and often has to play the “bad guy” to keep the household going. It would be easy to play the character as mean, but Hochwald finds beautiful layers within Kate and this may be my favorite role that I’ve seen her in. Megan Anderson’s portrayal of Maggie is a delight. She is sassy and bold and I wanted to be her friend. Her interactions with young Michael, full of riddles and imagination, were some of the most beautiful moments of the show. Anderson’s absolute abandon as she danced and sang and tried to bring lightness to the home made me yearn to get up and dance with her. Labhaoise Magee is a sweet, childlike Rose, the youngest sister. Her desire to embrace the world is palpable. Magee brings an unexpected combination of innocence and practicality to the role, which was interesting to watch. Christina (Katie Kleiger) and Gerry (Danny Gavigan) are Michael’s unmarried parents. Kleiger plays the dichotomy between who Christina is on her own and who she is with Gerry with aplomb. Gavigan plays Gerry with just enough charm to make you want him to stay and just enough smarm to make you doubt he ever will, which makes Kleiger’s performance that much more heartbreaking. Father Jack, played by Bruce Randolph Nelson, is my conundrum for this show. I have to say that I very much enjoyed seeing Bruce Randolph Nelson tell stories about Pagan rituals and be just a bit off his rocker – he really was captivating in his own right. But, in the context of the show, I’d have rather seen Father Jack. Unfortunately, Nelson’s authenticity in the role was lacking, right down to his on-again-off-again accent. But, Annie Grier’s performance as Agnes is the one I can’t stop thinking about. Agnes is the most subtle sister and her performance is perfectly understated and gorgeous. I couldn’t stop watching her, even as she sat in the background of a scene, knitting. I don’t want to give away her story arc, but I will say that her masterful performance makes it all the more poignant. 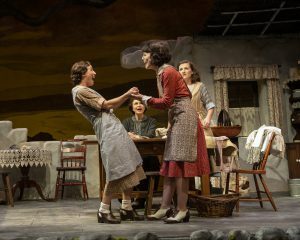 Overall, Dancing at Lughnasa is another stunning production from Everyman Theatre. From design to direction to performance, it is a must-see this season. I hope to get back to see it again before it fades to nothing more than a memory. 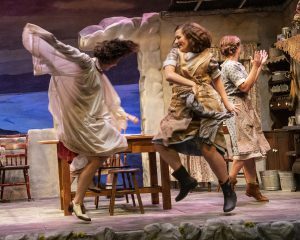 Dancing at Lughnasa will play through October 7 at Everyman Theatre, 315 West Fayette Street, Baltimore, MD. For tickets, call the Box Office at 410-752-2208 or purchase them online. 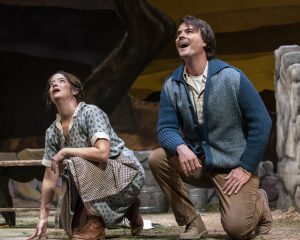 This entry was posted in Reviews and tagged Amber Paige McGinnis, Annie Grier, Annie Nesmith, Baltimore Theatre, Bari Hochwald, Brian Friel, Bruce Randolph Nelson, Cat Wallis, Dancing at Lughnasa, Danny Gavigan, David Burdick, Gary Logan, Jay Herzog, Jillian Mathews, Katie Kleigher, Labhaoise Magee, Megan Anderson, Phillip Owen, Tim Getman, Yu-Hsuan Chen by Jason. Bookmark the permalink.